Today I've seen something that I do not think I've seen once in the past 3-4 years so I decided to show it. 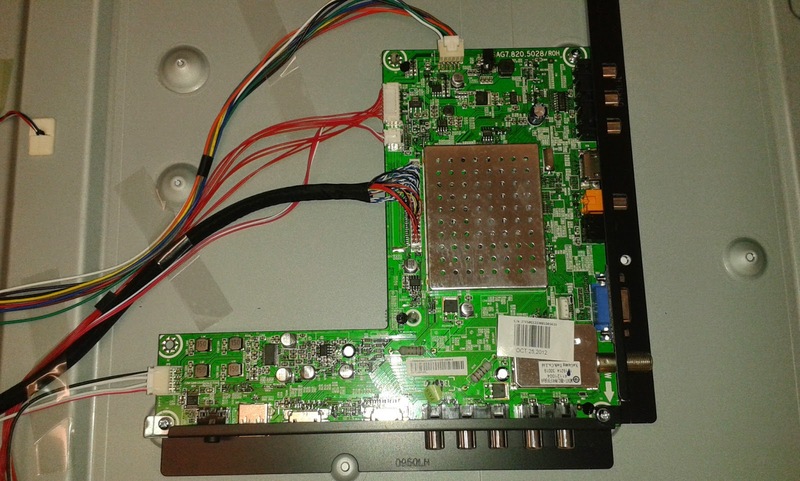 A power supply board SAMSUNG PS-426-PH / LJ44-00143A came in today, from a PHILIPS 42PFP5332D/37 plasma TV. Well the board in the above listing is NOT PS-426-PH / LJ44-00143A , but the customer went by the model number and we ended up with a board we have not worked on before. 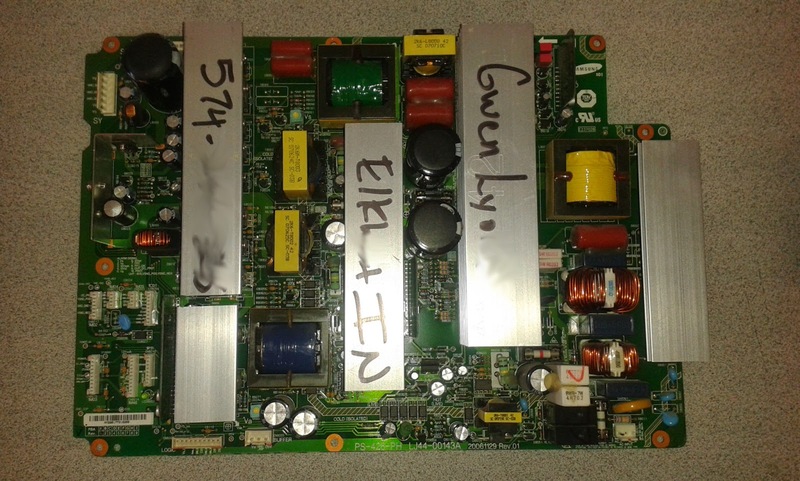 (the picture is of the actual customer's board; they had their contact info written on it so I had to smudge it a little with Gimp; I am sure there are better ways to do it, but I just smudged it). It had a blown 4A fuse (F8005 located between the two large capacitors in the middle of the board) and a quick test showed barely a few ohms resistance from the inside part of the fuse to ground - a pretty darn good reason for blowing if you ask me. Nothing unusual so far, right? Well, I tested the power FETs and they were good. I tested the power driver ICs for the Va/Vs transformers (they are separate on that board) and they were also good - nothing remotely close to short. There aren't many other power components on the other side of that fuse, honest. After 15 minutes of finding nothing I started desoldering the primary windings connections on the transformers....still nothing. C8054 (220uF/450V) , one of the two large capacitors around F8005 on the picture. First, it didn't look bulged, worn out or anything unusual, at least from the top; it's a little tight there so it was hard to see it all, but again nothing significant. Second, I do not remember having ever seen a large capacitor like that short out; I've seen many dry and get infinite ESR, but I haven't seen a shorted one. A steady low resistance on a capacitor this size and voltage was something I saw for first time in long enough to feel like first time ever. That turned out to be what killed the fuse. Just for the record, C8023 was visually swollen and had to be replaced and the Vs output filter capacitor was also bad although still functional. 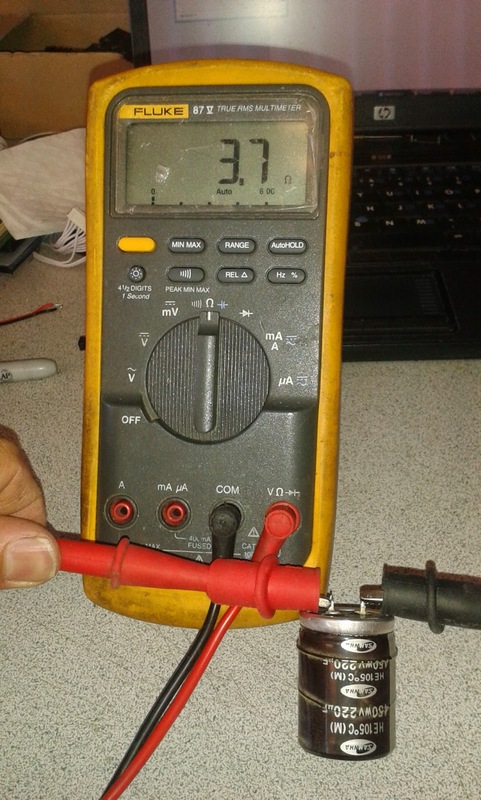 I have not taken its number, sorry, but it was 820 uF/250V and when I pulled it out it was doing the same rattling sound when I was shaking it that the bad one on the picture was doing..only it wasn't shorted. 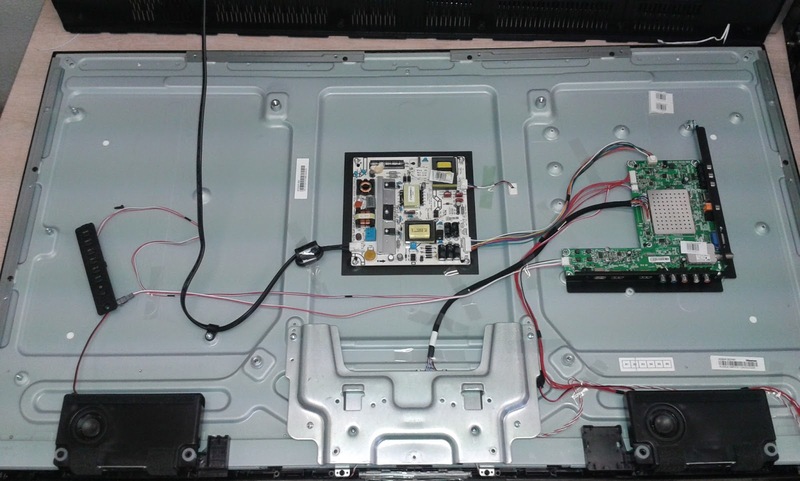 A week ago a customer brought in a Hisense 50K360G LED TV with the complaint of being totally dead. At first we thought it would be the power supply, but a quick check on it showed this was not the case. Before the pictures a few quick notes on the brand, times, politics and other important author observations almost certain not to be closely related to the issue at hand. When I was in China last year (how many TV repair technicians can say that, eh?) my local guide was Cindy, the sales girl for our vendor partner there. Actually at the time she has already left them and they were a bit annoyed that it was exactly her who was my guide. I choose her because she offered it, I did need a guide (and you would likely need one too!) and finally I did not actually know well their new sales person, which is by rule the only person (or people) in a Chinese company that speak English. Now I know Ana better and I would not mind her being my guide next time around, of course if only she offers it. So Cindy told me that in China Hisense is a popular brand that is considered quality. Looking at board design and construction I could also tell that either Hisense has been either making boards or licensing TVs to some American brands for some years or , at least, has been using the same sub-contractors to do boards for them as well known American brands. Which kind of puts them at the same high level. Which is all to say that I do like that I've seen from the brand. And I also liked the slim and elegant - if not ground breaking - design of the 50K360G. Only it was dead as a brick. Dang it, this is the reason why it is so cheap: there's practically nothing in there! A good 'ole plasma TV would hardly leave enough room for dust and when you open it you'd have the good feeling that there must be millions of things that could go wrong , they all have to be checked and customer would simply have to pay for all of it...because it was big, stuffed and expensive..and not just big, empty and cheap! Anyhow, we measured the voltages on the power supply board and they were somewhat OK. I say "somewhat" because they aren't exactly typical for a TV. A typical TV power supply would have a standby voltage of about +5V, a power board signalling pin that wakes up the rest of the output voltages and lots of connectors and pins on them where you can measure those voltages. On this TV there was no +5V standby, but there was a power-on pin and that is even more confusing because on standard televisions the power-on pin usually takes +2.5V to +5V (logical 1) to wake up. On this power supply board one didn't even have +5V handy and passing what was available was against, hmm, commons sense and past experience. What is available is 12V and 15V if memory serves me well. Luckily the power supply board specifications are printed on the board itself - BTW another sign for a higher end manufacturer. TO cut the story again, the power supply board indeed does provide +12V in standby mode and indeed takes +5V to activate the rest (which isn't much). Also, just like most other LEDs, the power supply produces AC voltage for empowering a chain of LEDs as opposed to DC voltage you'd expect if you just think of LEDs. As you can see this is a fairly well smoked component. This is the voltage stabilizer that takes the +12V standby voltage and makes +5V out of it. The same +5V you can use to manually engage the power supply BTW. Here's our advice: do not try to replace it. The same thing is likely going to happen. Modify the board to incorporate a more powerful stabilizer or send it to us and we'd do the modification. We were able to repair the board all right, but there is no guarantee this will always be possible. After all, when that thing fails, it may short the +12V input to the +5V output, sending the next circuits 140% power increase...and some of them may quit. Either the customer or we have broken the LCD display and now the TV has the value of my old running shoes, even without the odor! We paid the customer $150 for that TV because we weren't certain if it was us or her and we figured we can keep it and do repairs on the main board and the power supply board for people like you. And I am not making this up. I must say this is the first time something like that has happened. 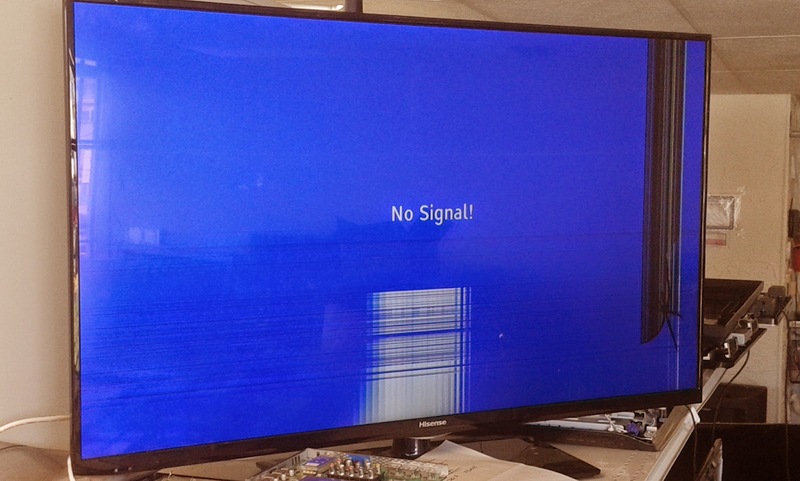 We've bought broken TVs before, of course, but frankly $150 is fairly high for a TV that will never sell. Dear Coppell TV Repair, after further testing the TV myself it doesn't have sound. It has great picture. Model is DP50741, chassis P50741-01, main board J4JF and when I switch to any HDMI input it says "Please use audio 3 input for DVI connection. Can you fix it?" The problem is not going to be limited to this particular Sanyo model, but since I haven't seen it before in this particular form I decided to post that article and let you know about it. The board would work just fine on all other inputs, including TV, composite and component. Did not actually try the VGA input, but on the rest it would have sound and picture just fine. Only on the HDMI inputs it would give the quoted "Please use audio 3 input for DVI connection." We were split between the HDMI multiplexor, the main processor external memory where various configurations are stored and the standby processor external memory where also various configurations, including, for example, the audio muting selection, is stored. Well long story short, this time it turned out to be the HDMI multiplexor IC. Granted , it could have been one of the other two. Or something we didn't think of. 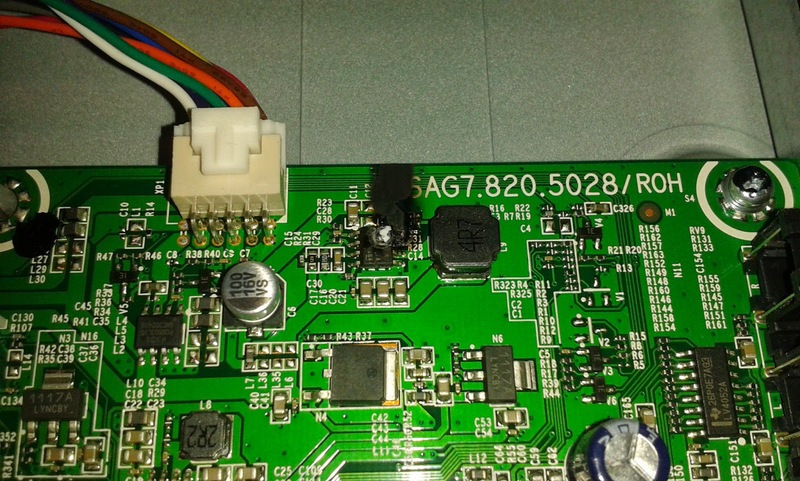 If you're not curious to experiment soldering ICs off and on to find out what caused it for you feel free to look at our board repair services at http://www.coppelltvrepair.com . And if you feel adventurous then well, good luck and hope this was of help!